Archaeologist have worked throughout eastern Honduras and the Mosquitia for 100 years, and we know quite a bit about the people that lived there in the past. The earliest known occupation in eastern Honduras dates to approximately 3000 years ago, about the time when linguistic evidence suggests Macro-Chibchan speakers from Lower Central America or northern South America migrated northward (Hasemann 1991: 50). The oldest known remains in eastern Honduras are confined to ossuaries in caves. Materials from the Cuyamel caves in the Aguan Valley have been dated to Period IV-a (1000-300 BC). Similar materials from the Talgua Cave, near Catacamas, Olancho, have been carbon-dated to 980-800 BC (Brady et al. 1995: 39). It is possible, then, that the remains from these cave ossuaries represent the initial populations who had recently migrated from the south and who were ancestral to the eastern Honduran cultures to come. According to analyses of stable carbon isotope ratios in bones recovered from Talgua, these populations were not subsisting on maize (Ibid. : 40), suggesting they participated in a southern pattern of root-cropping rather than the northern maize-agriculture tradition. However, in the Cuyamel Caves, there are decorative motifs on ceramics that are reminiscent of the Olmec, suggesting some northern contact as well (Healy 1974, 1984a). Of course, the Cuyamel and Talgua Caves may represent two distinct populations, with distinct heritage and connections. No open-air sites dating to the same period have been identified. A monochrome bowl. Ceramics in eastern Honduras are rarely painted. Instead, designs are incised, punctated, and modeled. The first settlements identified by Healy (1984a: 136) date to around AD 300, the beginning of Period IV-b, from the Selin Farm site. After this date, open-air sites occur with great frequency, possibly representing an increase in population around this time. My research reveals contemporaneous sites, possibly appearing as early as AD 250, the very end of Period IV-b. 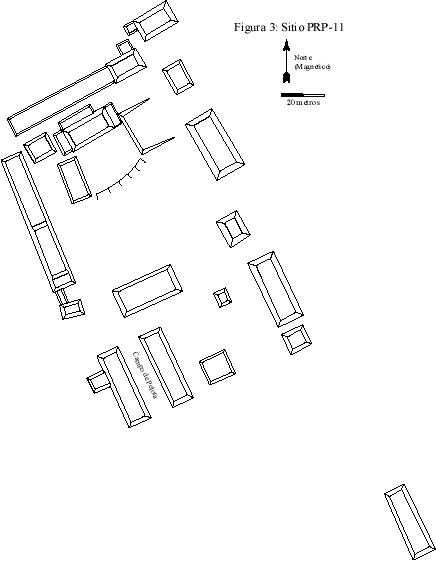 Even the earliest sites my research display evidence of supra-local political organization, whereas Healy’s early sites appear to be residential with no civic-ceremonial architecture. Although the dates are similar, Healy’s sites appear to predate those I recorded, based on ceramic evidence. The earliest strong evidence of complex societies occurs at the end of Period IV-b or the beginning of Period V, after AD 250 and probably before AD 600. All four carbon assays with dates in this range had midpoints between AD 548 and AD 635, possibly indicating a period of intensive occupation in the valley. The emergence of complexity around this time, before AD 600, is supported by the Altas de Subirana date, and by Strong’s description of Early Selin Phase ceramics (Period IV-b) at the large site of Wankybila on the Patuca river (Reyes Mazzoni 1976; Strong 1934a, 1935). Period V modes, such as vertical strap handles and manatee lugs, are common at the enormous sites of Dos Quebradas and San Marcos near Catacamas, which reportedly contain mounds over 10 meters in height. The large size and high degree of organization of sites such as these, as well as the sites of Wankybila and Altas de Subirana, suggest that examples of less developed, earlier complex sites may be located in the future. From the earliest evidence of complexity there was some degree of contact with Mesoamerica, evident most clearly in the formal, orthogonal site plans and in imported materials such as obsidian. This early interaction with northern groups appears to focus on elite paraphernalia and symbols, including jade, obsidian, and templates for public constructions. Carbonized maize associated with ceramics that probably date to AD 600 to 900 was found in a cave near the Talgua Village site (Brady, pers. comm. ), suggesting that along with changes in elite behavior came other changes, such as the addition of maize to the diet. The degree to which this may have supplanted root crops as a staple is unknown. Brady et al. (1998) report that stable isotope analysis from an individual from a Period V context in the Talgua cave showed little maize in the diet. Certainly, the modern groups still heavily utilize root crops, although maize is equally important. A significant change appears to have taken place near the beginning of Period VI. Shortly after the Maya ‘collapse’ and concomitant population declines or decentralization in central Honduras (Hirth 1989), the cultures of eastern Honduras (somewhat predictably) began showing less and less connections to the north, and stylistically began to resemble their southern neighbors. Unlike most societies to the south, the eastern Honduran polities built enormous public constructions, and appear either to have been organized in complex ways not seen elsewhere in Lower Central America or to have expressed their complexity in a radically different manner. It is unclear when societies in eastern Honduras reached their height. Healy (1984a) suggests an apogee in early Period VI, sometime after AD 1000. Data from the Culmí Valley suggest that Period V settlements are more numerous and larger than Period VI sites. This variation within eastern Honduras may indicate that the region did not reach its zenith at the same time in all places. While the Culmí Valley seems to have many Period V occupations, with few sites dating to Period VI, there are other areas, such as the Las Crucitas area, which primarily date to Period VI. 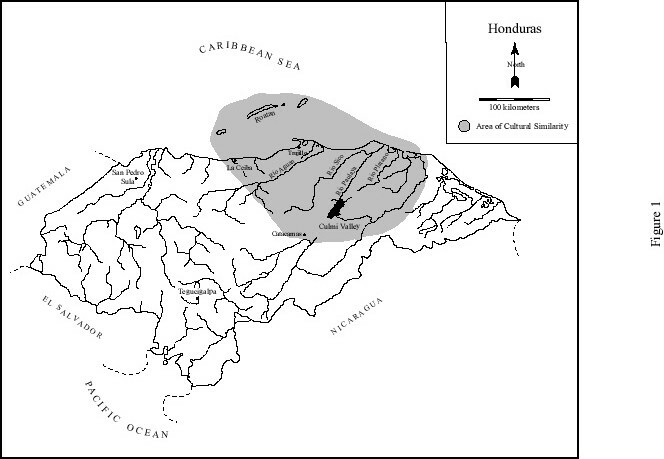 Most large sites previously reported, such as Rio Claro reported by Healy (1980, 1984a), are primarily Period VI. Important areas of eastern Honduras, particularly the lower Paulaya drainage which contains numerous large sites, remain temporally undefined. Many of the large sites in eastern Honduras are associated with an elaborate lapidary tradition which includes the large, intricately-carved metates. While usually dated to Period VI (Healy 1984a; Stone 1972), this tradition is similar to those elsewhere in Lower Central America (Richardson 1940) which are dated to Period V (Graham 1981). Several sites in eastern Honduras with large quantities of metates have a Period V component and some, like the Upper Group of Marañones, have no Period VI component. 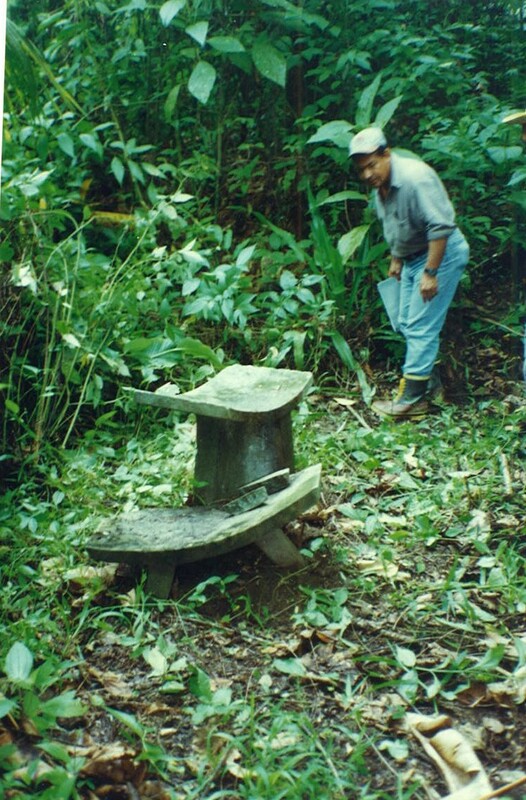 While this may suggest a Period V date, some sites known to have Period VI components, such as Las Crucitas, are also associated with the lapidary tradition, raising the possibility that this tradition of elaborate stoneworking continued in eastern Honduras after declining in the south at the end of Period V. I suspect that this tradition appeared during late Period V, when the precursors to Period VI patterns were beginning to appear. Epstein (1957) and Healy (1983, 1984a) date this transitional period to AD 800-1000. There appears to have been a widespread demographic collapse or a radical decentralization of the population in Honduras during Period VI, affecting western and central Honduras (Healy 1984a; Hirth 1989; Messenger 1991). Eastern Honduran populations continued strong during early Period VI. Late Period VI occupations are scarcer, hardly represented in the archaeological record of the Culmí Valley. It may be that late Period VI materials are difficult to distinguish from those of early Period VI, or it could be that a demographic shift happened during this period. This could have been a population decline, or a dispersal of formerly nucleated populations into smaller sites with a greater chance of under-representation in the sample. Judging from the artifactual assemblage which yields little late Period VI material, many of the larger archaeological sites had been abandoned by the time the Spanish arrived. Early chroniclers, however, report large polities that declined radically in less than a century. No archaeological site has yet been identified with these large villages described by the Spanish, although Healy (1984a: 153) suggests that the site of Rio Claro in the Aguan Valley may be the village of Chapagua, the center of one of these polities. Since none of the polities described by the Spanish can be securely associated with any archaeological site, the relationship of the extent of political control with the size/labor input in archaeological sites in eastern Honduras remains unknown. Lara Pinto (pers. comm.) suggests that that the largest prehistoric polities, represented by large archaeological sites, probably disappeared several generations before the arrival of the Spanish, since no living memory of the occupation of such sites was reported among the indigenous groups living in eastern Honduras during the early Colonial Period. One possible reason for the dearth of late Period VI sites may involve a change in architectural style. It may be that construction of platform mounds declined by the end of Period V, while complex social organization continued . Honduran archaeologist Pastor Gomez (pers. comm.) reports sites in the vicinity of the modern town of Olanchito, near the north coast west of Trujillo, which may be late Period VI and which contain little visible architecture despite the large artifact scatter. George Hasemann (pers. comm.) also reported a non-mounded site near Trujillo which may be one of the large settlements mentioned by Cortes. It is possible, then, that late Period VI sites are underrepresented due to the lack of visible features. Alternately, the late Period VI sites and contact period sites may tend to exist near or underlie modern settlements. These would have been subjected to destructive forces, such as plowing, to a greater degree than earlier sites which were not occupied during the colonial or modern period, resulting in less obtrusive sites and sample under-representation. The two important periods in the development of eastern Honduran societies were around AD 500-600 and AD 1000. The earlier date marks the date by which complexity had emerged in this area, while significant stylistic changes and a possible increase in population and the size of some regional centers occurred at the latter date. These may be related to events within Mesoamerica. The first date, AD 500-600, corresponds roughly to the hiatus in the Maya area associated with the decline of Teotihuacan as well as the reopening of the southern trade route through El Salvador (Sharer 1984). The second date roughly corresponds to the increase in long-distance trade at the beginning of Period VI, and it is about a century later than the Maya transformation or ‘collapse’ and associated demographic declines in central Honduras (Andrews 1985; Chapman 1957). In both cases, the decline of powerful polities with extensive trade and communication networks is temporally correlated with an increase in sociopolitical complexity or a population increase in eastern Honduras. While it cannot be demonstrated that these events opened up new opportunities for eastern Honduran elites or resulted in greater opportunities for trade and interaction by eastern Honduran groups, it seems unlikely that the correlation is completely spurious. Many of the differences between Period V and VI, such as the increasing emphasis on incision as a decorative technique on ceramics, appear around AD 800, during what Healy terms the Transitional Selin Period (Healy 1983, 1984a). This may relate to the transformation or ‘collapse’ in the Maya area. Other related phenomena, like the migrations of groups like the Pipil and Nicarao into El Salvador and Nicaragua at the end of Period V, probably affected developments in eastern Honduras (Fowler 1989a, 1989b). The appearance of feathered-serpent motifs on ceramics and rock art throughout the region may be related to these migrations. There is no archaeological evidence, however, for the migration of these or other foreign populations directly into eastern Honduras. Some sites that demonstrate a different, more Mesoamerican character in terms of their artifactual assemblages, such San Marcos (Strong 1935) or Chichicaste (Beaudry-Corbett 1995), appear to share many elements of material culture with adjacent regions of central Honduras and Nicaragua, and do not appear to be the result of intrusive Mexicans. Since no site occupied by Nahua-speakers at contact has been identified archaeologically, the material correlates that would mark the posited Nahua occupation of some parts of eastern Honduras at the time of contact remain unknown. 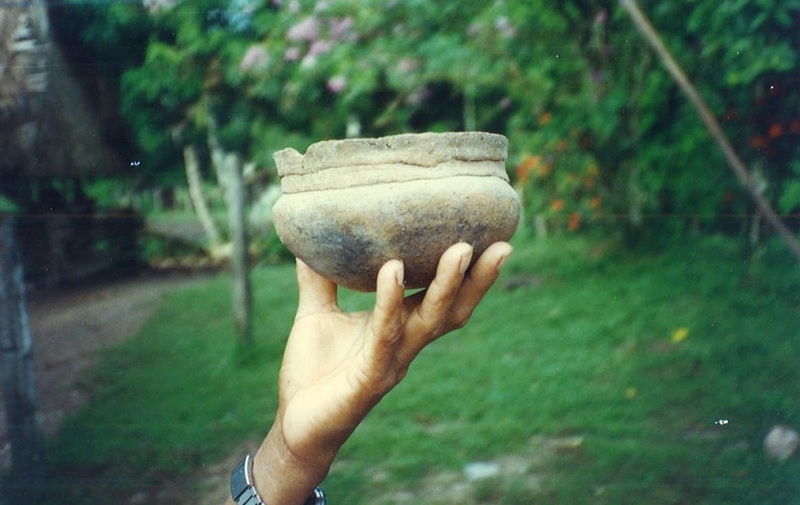 An unusual site recorded along the Paulaya River in eastern Honduras during the 1980s, HCN 82, has a ceramic assemblage very different from other sites in the region. These unusual ceramics appear similar to Costa Rican assemblages dating to Period III or IV-a. Unfortunately, the only record known to me are a series of black and white contact sheets on file at the IHAH offices in Tegucigalpa, and it was not possible to make a good identification. As I noted in earlier chapters, Healy’s Early Selin phase dates have midpoints near AD 500, and two-sigma ranges of AD 384-626 and AD 410-626, calibrated following Stuiver and Pearson (1993). Site PRP-100 was dated, at 95% confidence, to AD 252-779, with a midpoint at AD 563/591. This is not to suggest that complex sociopolitical organization is not evident in other areas of Lower Central America during prehistory. While complex organization has been demonstrated for many areas of Lower Central America (Hoopes 1992; Quilter and Blanco Vargas 1995; Snarskis 1984, 1992), it is not typically accompanied by large platform mounds.